A low has been trying to organize over the past several days. 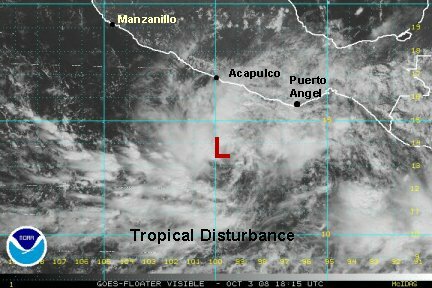 The visible satellite shows that a depression is about to form 215 miles south of Acapulco near 13.7 N / 99.9 W. Interests form Puerto Angel northwestward to Manzanillo should follow the progress of this system. Last edited by Caribbean Traveler on Sun Oct 05, 2008 7:08 am, edited 1 time in total. 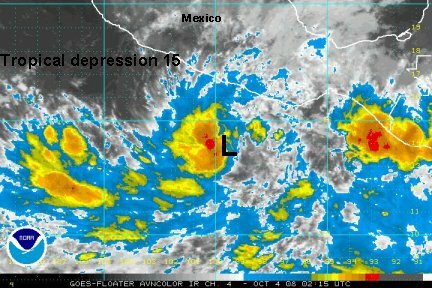 Tropical depression 15-E has formed about 230 miles south of Acapulco and has top sustained winds of 35 mph. It is not moving very much at this time. Some of t.d. 15-e's rain squalls may brush the western Mexican coast as it moves parallel to the shore. 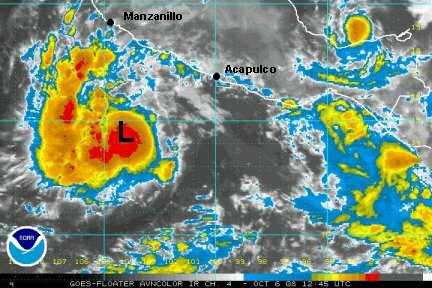 All interests on the west coast of Mexico and the southen Baja should follow the course of this tropical cyclone. With weak wind shear, t.d. 15-e has a good chance to strengthen, possible to a hurricane. 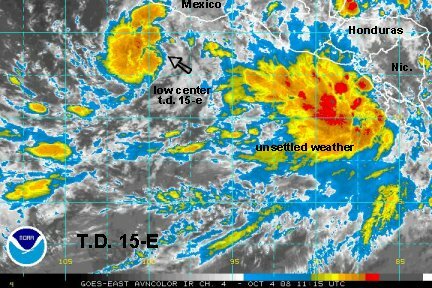 Tropical depression 15-E has gained convection of the western side of the circulation. The low center itself was just east of the mass of convection, but has drifted nw near it at this point. It is getting close to tropical storm strength and will probably be classified as one sometime today. The heavy rain remains mostly offshore, although is barely touching the coast just southeast of Acapulco. The forecast shows that this tropical cyclone should parallel the coast and strengthen over the next few days. Interests on the western Mexican coast and southern Baja should follow its progress. Also, note that there is a developing region of unsettled weather west of central America. This may be our next tropical depression. 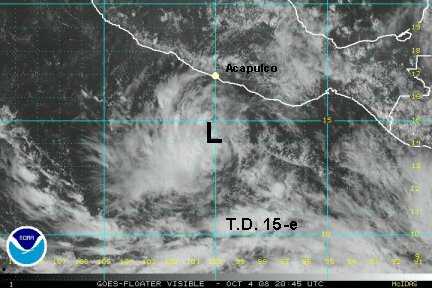 Tropical depression 15-E is centered near 14.2 N / 100.3 W or about 190 miles south of Acapulco. Deep convection continues to build near the center of circulation and will likely become a tropical storm within 12 hours at this rate. Heavy rain remains offshore at this time as the tropical cyclone is paralleling the coast. Conditions are favorable for further strengthening. Norbert was upgraded to a tropical storm last night and continues to strengthen. Top sustained winds are at 45 mph officially. A microwave estimate was up at 59 knots a few hours ago. We'll stay on the conservative side, but still think it's higher than the 45 mph and go with 50 mph. The heavy rain associated with tropical storm Norbert remains off of the coast and may continue to do so for the exception of a rain band that develops on the coast. 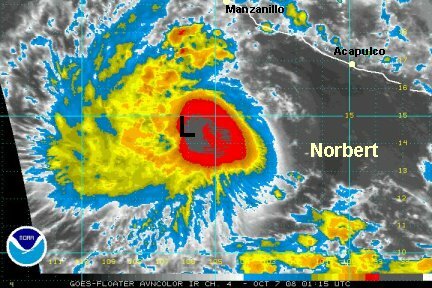 There is a good chance that Norbert will reach hurricane strength. 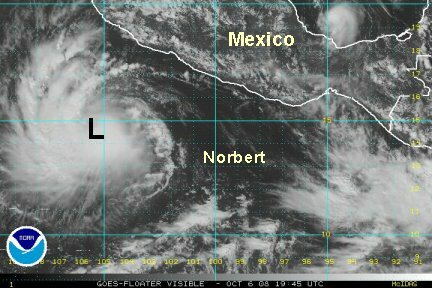 Interests along the western Mexican coast and the southern Baja should contine to follow Nobert. 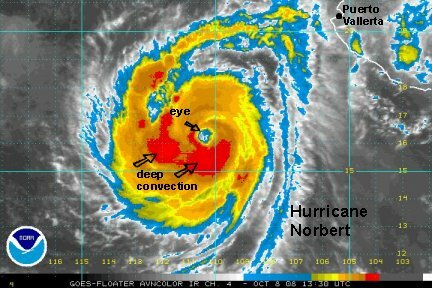 Norbert has leveled off today around 60 mph. Microwave estimates came in higher earlier today, but we agree with NHC with the 60 mph speed. The heavy rain remains offshore and the system is forecast to track west of Baja. A more complete update coming up later this evening. Tropical storm Norbert is centered about 340 miles south of manzanillo. Officially it is moving west at 8 mph. It looks like more wnw to us. A burst of very deep convection is on the southeast side of the circulation. A smaller development is now west of the low center too. This is a sure sign of organization of Nortbert, on its way of becoming a hurricane. At this rate, Norbert will become a hurricane by Monday afternoon. We think that the National Hurricane Center's estimate of 65 mph is right on target. A few rain bands have developed on the west coast. One was just north of Acapulco another near Manzanillo. Locally heavy rain can be expected with these scattered storms. The heaviest rain will remain offshore with the low center. Expect surf to build on the west coast of Mexico and southern Baja over the next few days. Forecast models have been taking Norbert wnw then nw, west of Cabo. Some then weaken it to at least a tropical storm before moving toward the west central Baja. Tropical storm Norbert is centered at 14.3 N / 104.4 W or about 330 miles south of manzanillo by our estimates. It appears to be moving wnw slowly near 7-8 mph. Top sustained winds officially are 65 mph from the National Hurricane Center. We still agree with their estimate and think that the 67 knot wind from the microwave satellite is too high. The deep convection is expanding though, so 70 mph may be a good estimate for top sustained winds soon. A band of scattered showers and storms is just starting to develop on the west coast. Locally heavy rain is possible. The strongest storms and most continuous rain will remain offshore. Forecast models have been taking Norbert wnw then nw, west of Cabo. 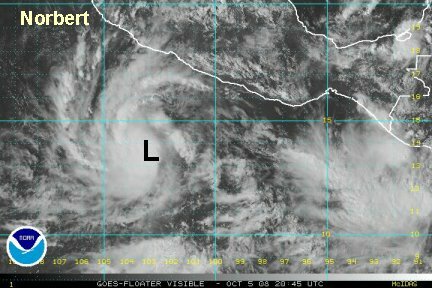 Some then weaken it to at least a tropical storm before moving toward the west central Baja about 50-100 miles north of Cabo. Tropical storm Norbert is centered 14.5 N / 105.3 W or about 320 miles southsouthwest of Manzanillo. Top sustained winds are officially at 70 mph. A recent microwave satellite estimate was 67 knots. We think that the 70 mph estimate is ok, but may be very close to 75 mph. The National Hurricane Center will likely make Norbert a hurricane on the 8 pm pdt advisory. There are only a few showers on the coast. The heavy rain and strong winds remain offshore. Forecast models have been taking Norbert wnw then nw, west of Cabo. Some then weaken it to at least a tropical storm before moving toward the west central Baja about 50-100 miles north of Cabo. This course will be be in response to a deep trough dropping into the Western U.S. Tropical storm Norbert is centered 14.7 N / 106.0 W or about 320 miles southsouthwest of Manzanillo. The National Hurricane Center plans to upgrade to hurricane status at 11 pm edt (8 pm pdt). There is a huge burst of convection near the center and to the east. Top sustained winds are at minimal hurricane force now. There is no change to the previous forecast. The motion should be wnw to nw then recurve into the southern Baja north of Cabo as a trough turns it. Norbert looks slightly weaker and may be just under hurricane force again. Officially the National Hurricane Center had 75 mph on the last advisory. Norbert is still offshore near 14.7 N 107.5 W. The heavy rain and strong winds are well away from the coast. Building swell can be expected on the Mexican west coast and southern Baja. The forecast still calls for a recurving into the southwestern Baja. Hurricane Norbert is expanding and strengthening. 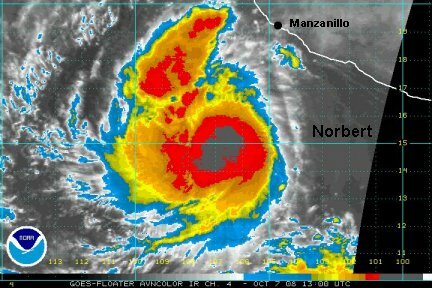 At 7 am pdt, Norbert was centered near 14.9 N / 106.8 W or 585 miles ssw of Manzanillo. Officially top sustained winds are 75 mph. We think 80 mph is a better estimate with the increased organization on the satellite imagery. One outer band is only 200-300 miles the southern Baja. The forecast still generally is the same with Norbert being picked up by the trough into the southern Baja. Hurricane Norbert is getting better organized. An eye is now becoming visible on the satellite imagery. The National Hurricane Center increased the winds to 80 mph to agree with us on their last update. We now think 85 mph is a better estimate. 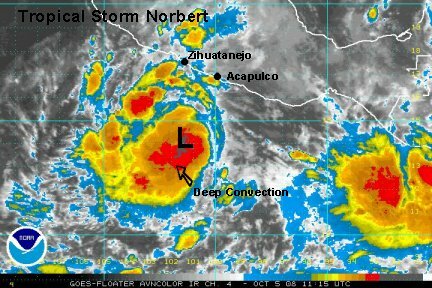 At 1:30 pm pdt Norbert was centered near 15.3 N / 107.7 W or about 540 miles sse of Cabo San Lucas. Heavy rain is remaining offshore and the only effects noticed in western Mexico will be increasing swell. 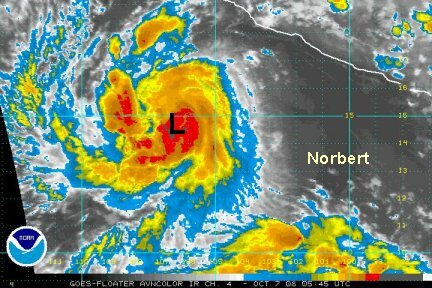 The forecast still call for Norbert to recurve near the southern Baja. 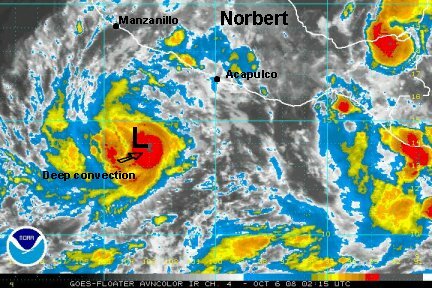 Interest is this area should follow Norbert carefully, since it may make landfall as a hurricane or strong tropical storm. The National Hurricane Center had Norbert at 105 mph on their previous advisory. The strengthening trend has continued. The cloud tops continue to cool in the eyewall. Our estimate is now 110 mph. It would not surprize us to see it classified as 115 and a category 3 on the next update if the current trend continues. Hurricane Norbert is centered at 15.8 N / 109. 4 W or 485 miles south of Cabo San Lucas at 11:45 pm pdt. It is moving wnw still at around 10 mph. The eye is expanding and looks to be about 60 miles wide. 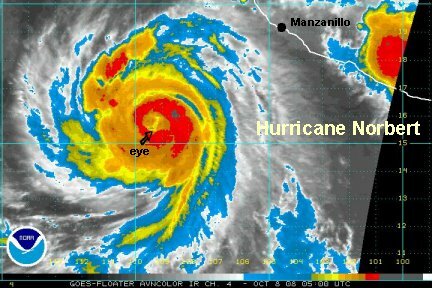 A large eye for a hurricane. If the eye contracts this still should allow for strengthening before moving over cooler water. Norbert is still expected to turn northwest then northeast by Friday. It could be close to the southen Baja by Friday night or Saturday. 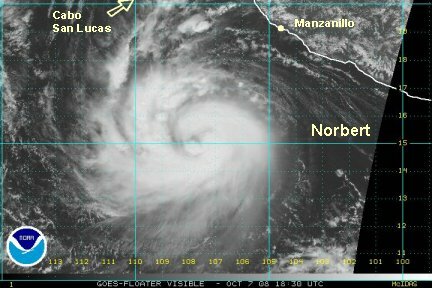 Interests along the southern Baja should contine to follow Nobert. Norbert continues to organize and the eyewall has contracted. This is still a sign of strengthening. The National Hurricane Center had Norbert at 115 mph on their previous advisory. Our estimate is now 125 mph. This may be consevative. A recent microwave satellite estimate had a wind of 138 mph. Sometimes we disagree with NHC, this time we have been right on with them. Everytime we make a change, they have the same update shortly thereafter. Hurricane Norbert is centered at 16.3 N / 110. 4 W or 450 miles south of Cabo San Lucas at 7:15 am pdt. It is moving wnw still at around 10 mph. The eye has contracted and looks to be about half as wide as before - 30 miles wide.